Giorgio Simonelli's Robin Hood and the Pirates takes an incredible amount of liberties with a familiar English legend. In this particular retelling of the story of the man in Lincoln green, Sherwood Forest has been re-branded as Sherwood County. It is no longer a woodland but is now a beach! This is all to facilitate the novel and dramatic development of the eschewing of all reference to the famous Merry Men and instead placing Robin of Loxley at the head of a fearsome band of pirates. 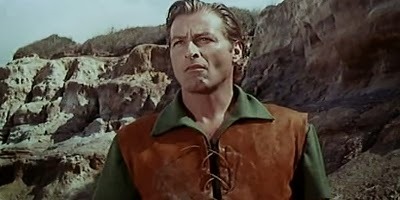 Former action star and Tarzan star Lex Barker takes the lead role on this occasion and the plot concerns the attempts of Robin to defeat a usurper. Romantic interludes are provided by Italian speaking English actress Jocelyn Lane, who here plays Karin. Karin being a sort of Maid Marion figure. While the complete reconfiguration of the legend may seem somewhat bizarre, especially given the familiarity of the material, the results actually work pretty well. After all, if Maciste can meet Zorro then why can't Robin Hood lead some pirates? The results are great fun and surely that is all that matters.